Citation Information: JCI Insight. 2019;4(7):e124174. https://doi.org/10.1172/jci.insight.124174. 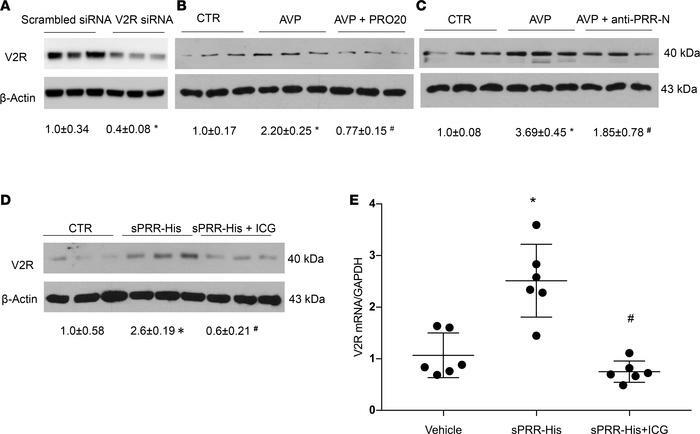 PRR-mediated AVP upregulation of V2R expression in primary rat IMCD cells. The IMCD cells were pretreated with PRO20 or anti–PRR-N antibody and then treated for 24 hours with 10 nM AVP. V2R protein expression was determined by immunoblotting and normalized by β-actin. (A) The validation of anti-V2R antibody by using V2R siRNA (n = 3 per group). (B) Effect of AVP alone or in combination with PRO20 on V2R expression (n = 6 per group). (C) Effect of AVP alone or in combination with anti–PRR-N antibody on V2R expression (n = 6 per group). In another experiment, primary rat IMCD cells were pretreated with a β-catenin inhibitor, ICG001 (ICG), and then treated for 24 hours with 10 nM sPRR-His. V2R protein expression was determined by immunoblotting and qPCR and was normalized by β-actin and GAPDH, respectively. (D) Effect of sPRR-His alone or in combination with ICG on V2R protein expression (n = 6 per group). (E) Effect of sPRR-His alone or in combination with ICG on V2R mRNA expression (n = 6 per group). Statistical significance was determined by using unpaired Student’s t test. Data are means ± SEM. CTR, control. *P < 0.05 versus control; #P < 0.05 versus AVP or sPRR-His alone.